In the far future, civil war has erupted. Or perhaps just normal war. Dozens of factions began warring after an unsteady era of peace, which followed a long period of exploration and expansion into the galaxy. Alliances were forged and re-forged, factions rose and fell, enemies became friends and then enemies again. Fighting is pretty much the only constant left in the galaxy. In the midst of that, two major factions happened to send out ships to claim a certain planet at the exact same time, and now they’re going to fight over it. It seems that everyone brought the exact same ships and equipment and everyone has an even chance of winning the battle. Given that this is supposed to be happening in the midst of constant war and chaos, I’m not exactly sure what’s “first strike” about it, but so it goes. 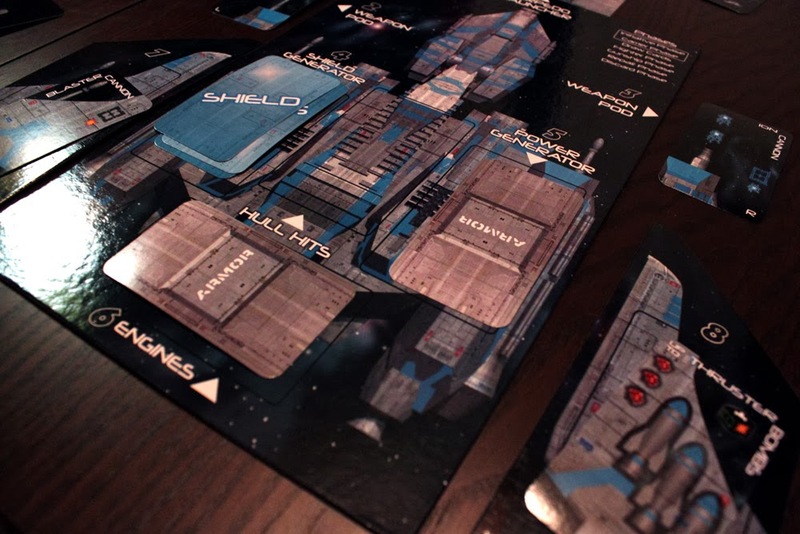 This is the backstory for Gunship: First Strike, a board game in which players take control of powerful gunships and battle for control of the planet below. Gunship: First Strike is primarily a 2-player game, so my explanation will generally assume that’s how its being played. 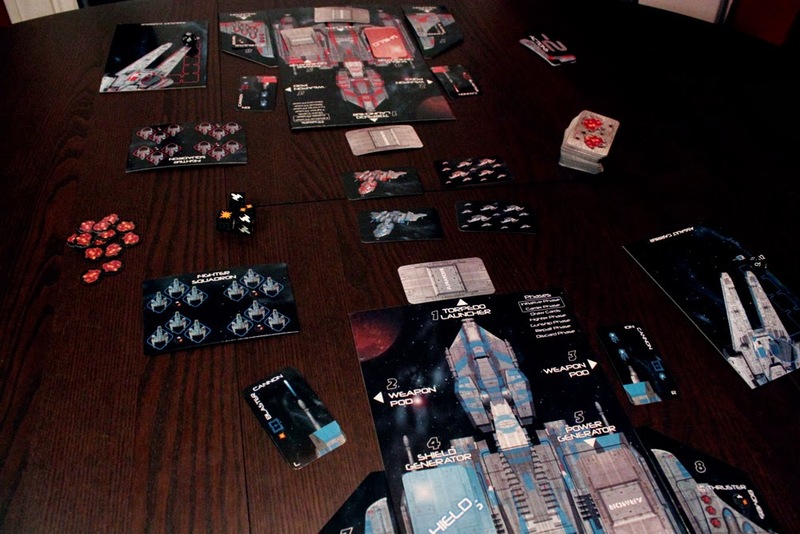 At the start of the game, players have a chance to mildly customize their ships by placing guns (either Ion Cannons or Blaster Cannons), Thruster Bombs, and Armor on various slots around the ship. When both players are ready, play begins. The “battlefield” is fairly abstract, with only three locations–each player’s Carrier space, and a center zone. Gunships and fighter squadrons start in this area. The goal of the game is to destroy the opponent’s Carrier–with the exception of the possibility of both Carriers getting destroyed, the state of your gunship and fighter squadron doesn’t matter at the end. At the start of each round, players will roll for initiative, which will randomly determine which player gets to take their turn first each round. 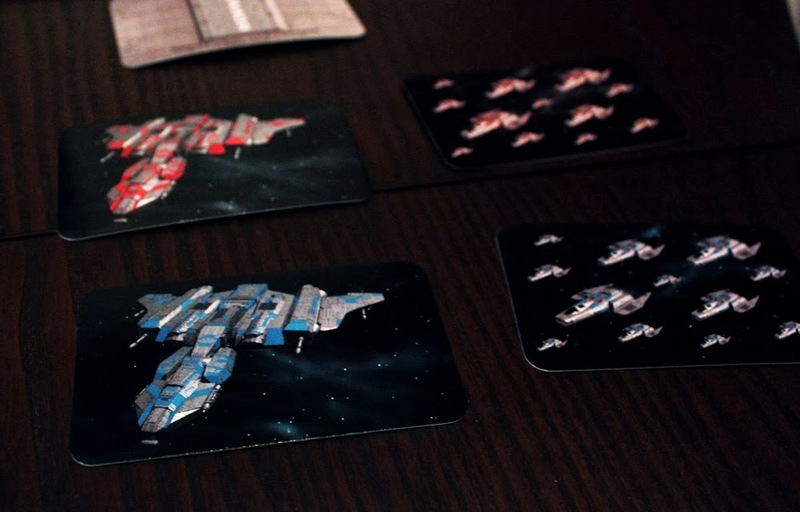 After initiative, each player’s Carrier fires at the other Carrier via a random card draw, which could represent a hit, a miss, or a double-hit. Carriers have 6 shields and 12 hit points, although there is effectively no difference between the two; Carrier shields can’t be recharged, so your carriers can take 18 hits. Then, players take the rest of their turns, in initiative order. 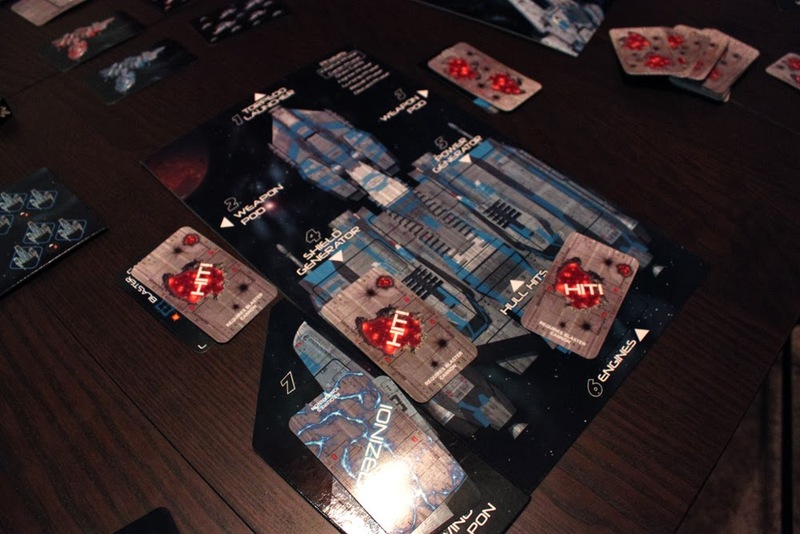 One player will draw cards til they have five cards in hand, move and attack with their fighters, take three actions with their Gunship, have a chance to repair, and can then discard one card from their hand, then the next player goes. Fighters can move and attack as much as they like, with the exception that they must stop if they move into a location with enemy fighters. Also, they can only strafe an enemy gunship once per turn, and they can’t do anything to the enemy carrier. Gunships get three actions, two of which can be spent on movement. Other actions include firing weapons (for which cards are played from their hands), making attack runs against the enemy carrier (requiring a Torpedo card or thruster bombs), and making repairs (assuming the gunship is docked at a friendly carrier). Repairs allow gunships to restore destroyed weaponry, recharge shields, change their equipment loadout, reapply armor, and reattach wings (yes, they can get blown off). These are the cards you will randomly draw throughout the game. We still haven’t really figured out how Slagged works.Attacks are made in various ways depending on what is attacking and what is being attacked. Attacking fighters roll dice and score hits per white result. 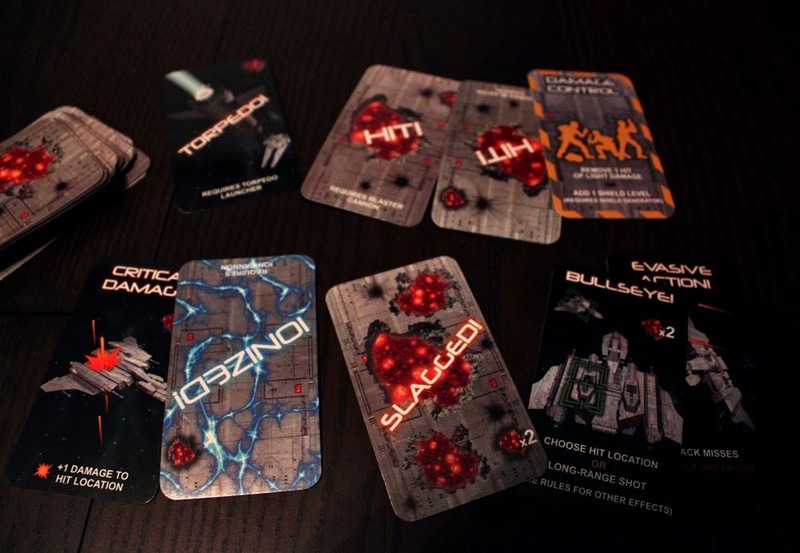 Gunships must play cards corresponding to their weapons – a “hit” card for Blasters, and an “Ionized” card for ion cannons. Gunships attacking Fighters roll dice after playing those cards and destroy fighters for each white result; gunships attacking Gunships automatically hit unless the defender plays an “Evade” card, but hits can be absorbed by shields, and the actual area of the ship affected depends on a random die roll. Each section of a gunship generally stops functioning with a single hit; light damage can be repaired in-flight, but heavy damage requires docking at your own Assault Carrier. Damage for the most part will decrease your firepower by damaging weapons, but can also blow off wings, slow you down by crippling your engines, and even disable your ship entirely by hitting your power generator. Gunships can also attack Carriers, but only with a Torpedo card (assuming torpedo tubes haven’t been disabled), or using Thruster Bombs (an equipment card installed on your ship), but the Carrier gets to roll 4 dice as a defensive measure. Play continues until someone’s carrier has been destroyed and all players have had an equal number of turns. The base game includes rules for a 2-vs-2 mode, and a small expansion is available that adds a few more options, improved components, and allows 3 and 4 player free-for-all. Stellar Victory or Galactic Defeat? Gunship: First Strike is not trying to be an incredibly deep starship simulator. It’s trying to be a fast-paced action game of blasting your friend’s ships to pieces with futuristic weapons, in space. In many areas, Gunship gets it right. It’s got a lot of thematic elements, it has some slick mechanisms, and it gives players a fighting chance the whole time, all contained within about a 45-minute experience from start to finish. This is the Center Zone. So yeah, not a lot of tactical maneuvering. Unfortunately, in many other areas the game is clumsy and messy, with convoluted or unnecessary rules that sully the experience. Let’s dive a little deeper. The biggest ankle-weight strapped to the game is the overdeveloped sense of randomness. Now, in a game like this I expect there to be randomness. 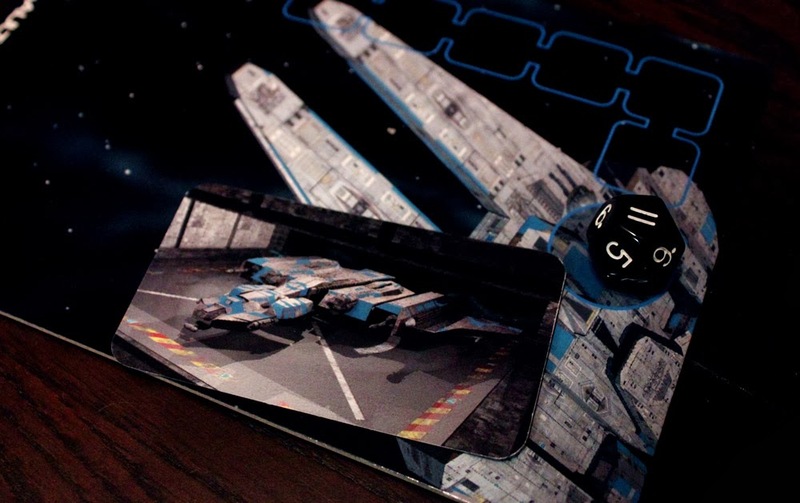 It’s almost guaranteed in any sort of combat-centric board game, and some of my favorite games of all time (Star Wars: X-Wing, Twilight Imperium) involve rolling dice. Randomness is okay, as long as you can do something with it. The problem that Gunship has is the multilayered levels of randomness, and the randomness that just happens outside of anyone’s control.A big part of this is how all of your actions are tied to the cards you have. No matter how you’ve equipped your ship, you can’t fire your weapons without the right cards. You can’t repair on the fly without a special card. You have no chance of dodging enemy attacks unless you happen to have an evade card. This is exacerbated by the random nature of attacks stacked onto random card draws. Gunships attempting to destroy fighters not only need to play those hit cards, playing the cards only lets them roll dice to attack fighters. Given that a hit against a gunship is far more significant than a single hit against a fighter (and your fighter squadrons can attack enemy fighters), it’s a waste for that. Gunships targeting gunships, if their shots are not evaded, do damage to a random component. This wouldn’t be a problem except for the drastically imbalanced nature of damage. Losing a weapon stinks, but it’s not devastating. Taking a hit on an engine will slow you down. Getting hit in the power generator? That’s bad news. Especially with the Ion cannon, which does less damage but has an insanely powerful effect if it happens to hit that power generator–it basically causes a lost turn–and it bypasses shields AND armor, meaning there is absolutely no defense against it, nothing you can prepare for. Fighters are both too unlimited and not functional enough. They can fly freely around regardless of distance, allowing them to attack an unescorted gunship and retreat back to a defensive position with little consequence. If they do happen to be blocked by enemy fighters, well that’s okay because you might as well attack those fighters as much as possible anyways. Unfortunately, there’s no benefit to attacking or defending–when your fighters engage in a dogfight, both sides roll dice and do damage with no bonuses or penalties either way. There’s just nothing interesting about maneuvering your fighters; on paper, they defend your Gunship from enemy fighters, but in practice they do very little except roll randomly against each other. On top of all of this, the randomized fire between carriers at the start of each round makes almost everything else in the game fairly meaningless. With the business of attacking the other gunship, retreating for repairs, and limited attack power against carriers (torpedo cards or thruster bombs required), Gunships will be able to attack once, maybe twice every 3-4 turns, usually doing 1 damage, possibly 2, in that attack. In the meantime, every round carriers are damaging each other. Most of the cards revealed will be hits, which means Carriers will hit each other basically every turn. Over the course of the game, carriers will likely do 70-80% of the damage against each other. I’ve seen players scoring maybe 4 hits, 5 at most, on an enemy carrier through their own attacks; the rest of the damage (Carriers have about 18 hit points) comes from this randomized carrier-on-carrier attack. It certainly serves to move the game forward at a constant pace, but it also serves to make you feel like your choices barely matter since most of the damage comes from the game’s automated randomness. It seems like there’s a lot of potential here; carriers could only damage each other’s hull, perhaps, and with regenerating shields it’s up to the gunship to keep those shields down, but that’s not how it is. At the very least, I’d feel more control if the carrier phase was just cut out and Carriers had 5 or 6 hit points. Maybe it’s supposed to be thematic or something, but random carrier fire overwhelms actual damage scored by gunships more often than not. If you think about it, you start to realize the game seems to be playing itself while you sort of participate.In a game I played, my opponent went first and had a hand full of Hit cards, so he blasted me to pieces. It wasn’t really a choice; that’s just what he had access to. Since I had no Evasive Action cards, he ruined my shields and damaged one of my weapons before I even got a chance to move. I had fully equipped myself for a carrier assault though, so at great risk I decided to ignore the damage and make a suicide run against his Carrier (I didn’t have any Hit cards to fire against his Gunship anyways). My risk paid off, and in the next three turns I managed to score five hits against his Carrier with my gunship, in addition to the carrier fire. I had to limp back to my carrier for repairs since my ship had been torn to pieces in the process, but my opponent had not succeeded in equaling damage against my own Carrier. By all rights, I should have won; I would have been able to repair my gunship and return to attack his carrier one more time. Instead, during the Carrier phase his draws were luckier than mine, and he scored several double-hits while I landed a few misses. Because of this, I was not able to get my Gunship out again and my Carrier got destroyed before his, simply because of the carriers shooting at each other which neither of us had any control over. Had I retreated on the first turn to get repairs before making my suicide run, I probably would have lost by even more because I would not have had the time to make any significant assault against his carrier. Looking back, it seemed at the time that I had choices–I could have retreated for repairs, but I chose the kamikaze run instead. But taking the whole game into account, my choices were meaningless. I had played better and had more luck with the actions I controlled but lost because I had less luck with the things no player had control over. Randomness outside of player choice drives the game more than anything else. Aside from these things, there are a slew of additional rules that feel completely unnecessary and just add to the pointless randomness. For example, the fact that initiative is rerolled every turn, which can be a huge advantage if a player gets to go twice in a row, since players don’t draw new cards til the START of their turn. A player can drain an opponent’s Evasion cards, and with a little luck get the next initiative, refresh their hand with more hits, and do massive damage before the other player can defend. There is no point to this shifting initiative, given that there are already rules for players receiving equal turns and certain actions technically occurring simultaneously. I would so much rather be able to alternate turns evenly, and to fire my weapons whenever I wanted to and just roll dice, rather than requiring cards–just make the cards all the special actions. Since you already have to play those cards before you know if you hit, that would add a sense of tension, a sense of risk in using them up, which would work a lot better than having to collect Hit cards. There needs to be more ways to focus on the aspect of the battle that is most important to you at the moment; if my ship is badly damaged or weapons and shields are out of commission, why can’t I focus on evasion over attack? Why do I have to hope the luck of the card draw gives me what I need to do what I want?There are some clever ideas in here. The fighter squadron is handled neatly–you move your squadron as a group, but a board tracks how many fighters have been destroyed. 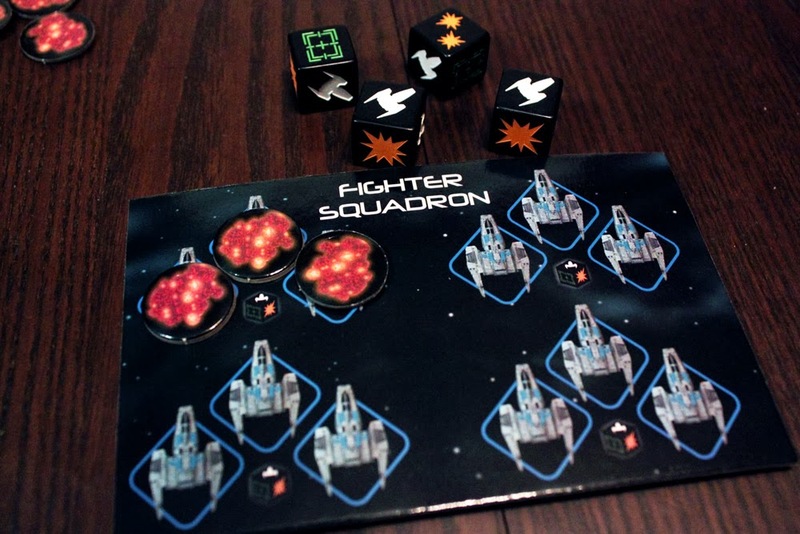 The more you lose, the weaker your squadron is, resulting in fewer attack dice. It’s unfortunate that there’s just not all that much interesting to do with your fighters. The way components are placed on ships works well, and customization is pretty easy. It’s just too bad that in-game activity depends more on the cards you draw than your ship customization. I like that hit cards can simply be overlayed on the components they hit to immediately represent and track damage; I like the special modifier cards that you can risk to add extra damage or to target specific locations. I wish all the cards were these special cards and your normal attacks and evasions were just dice rolls. It’s fun to pilot your ship. It’s fun to roll the attack dice, it’s just so far separated from your actions you begin to wonder why is the randomness piled on top of more randomness. It’s fun to make attack runs against the enemy carrier, but doing so only gives you a chance to tip the balance, and has less effect than the uncontrolled carrier fire. I like that you can repair your gunship. It lets you take risks and fail without being completely out of the game; it’s just too bad that while you’re repairing your ship (which happens at a pretty reasonable rate, if you ask me), the carrier fire will take care of a significant portion of the damage needed without even asking you. This fully armed and armored gunship is about as useful as a TIE Fighter pilot. It might do some damage but ultimately something else will decide the course of battle. The fact that so much is out of your control just takes away from all the cool stuff. There’s such potential here that the game misses out on. It feels like the designers went out of their way to make sure that you could take damage with your gunship but still be in the game and have a chance to win, but they did so by taking away so much of what would make the game interesting. So much strategy is removed. The game only takes about 45 minutes, sometimes faster; if someone gets blown to pieces it’ll be over quickly. There was no need to soften the system so much. As for components, it’s really hit and miss. I mentioned the fighter boards and the ship boards, which are nifty. I like that the wings are not attached so when they get blown off they can be physically removed. I like the Carrier boards and how shields and hit points are tracked with those, even if the distinction between the two is academic. The combat dice are cool.However, every board is warped a little bit, and the boards lack helpful information. Sure, the main board has turn order listed, but components that utilize dice rolls do not indicate which symbol results in success (which is different for different attacks, annoyingly), even though they do indicate that dice are rolled with an icon. Components do not tell you the result of damage; not so bad for weapons (you can’t use them anymore) but for things like the Power Generator and Engines, which are harder to remember, you’re going to need the rulebook handy. The gunship lands on the carrier to get repairs. I mentioned earlier that there is a 2 vs 2 option included in the core game. I highly recommend not touching this mode; you may want to play with four players but the convoluted mess of rules that were written to accommodate more than the 1 on 1 standard gameplay are… well, they’re a convoluted mess. Rules that should transfer over pretty logically–especially in regard to fighters–instead get hashed into messy, confusing instructions. The game is also best played quickly with a lot of action, and having multiple players slows the game down and makes it, well, boring. I’ve been pretty harsh in this review. I do want to clarify that I didn’t have a horrible experience playing the game. I had a bit of fun, even, when playing with 2. But, much like icing on the cake, the icing loses its appeal quickly if the cake beneath it has a bad taste. I like a lot of what the game has to offer; the customizable ships, the explodable wings, the fast-paced nature of the combat between gunships. But this game doesn’t leave a satisfying taste after all is said and done. When you can look back and see how little your actions and choices mattered during the game, how much randomness is layered atop randomness, it doesn’t become something you want to play again and again. This game could gain a huge boost from a streamlined ruleset, from more options in customization; asymmetrical technology and ship layouts could be a huge boon. As it stands, it’s hard to recommend a game like this. Maybe some of you don’t mind the randomness; if you don’t, you could have a lot of fun with the game. You might even be able to house-rule some of the randomness out–I’d start with ditching initiative rolls and the carrier phase, while reducing carrier HP to 5 or 6 points, for one–but I don’t review games based on house rules; I review them as written.I hope this game gets a new edition someday, with revamped rules. This could be a very enjoyable game that I would want to hit the table frequently, but instead it’s a game box with a lot of good ideas and a hot mess of poor implementations. It’s not broken; it’s playable and you can have fun. But it’s hitting a fraction of its full potential. 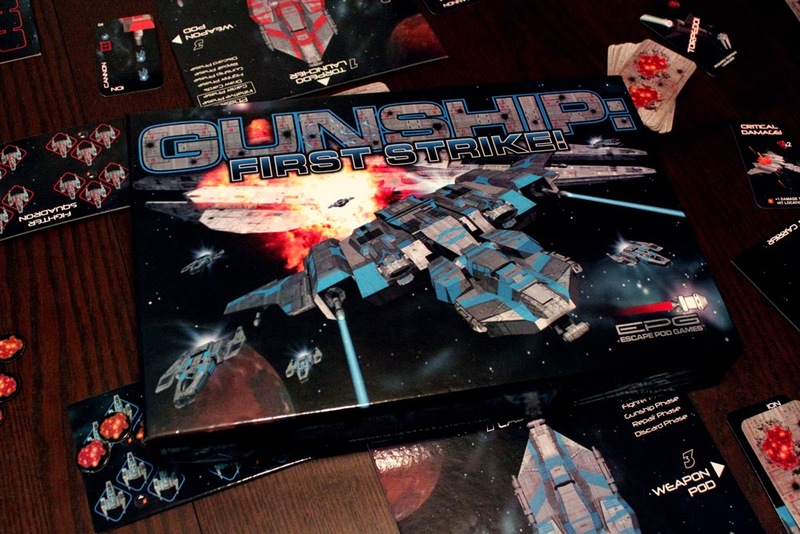 iSlaytheDragon would like to thank Escape Pod Games for providing us with a review copy of Gunship: First Strike. Clever use of boards for tracking components, damage, etc.